The colorful ingredients of this coleslaw make it tasty and pretty! This is a big batch. Good for parties or for eating over a few days. With your food processor's shredding blade, shred the cabbage and cauliflower. Flip the disk over and use the grate side of the blade to grate the carrots and apple (leave the skin on the apple, because it makes a pretty addition to the slaw.). You can shred and grate by hand, but it takes a lot more time and work. Slice the green onions into very thin rounds. Combine all of the ingredients in a very large bowl and stir until well mixed. 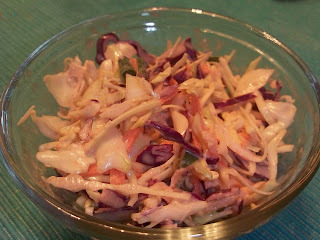 You can eat the slaw right away, but it tastes even better once it has sat overnight.